This is the true story of my favorite lesson horse, my best friend, my soulmate ,my partner. I just arrived at the barn for my weekly riding lesson and went to check the whiteboard on the tack room door to see who I was riding, hoping I would ride Jewels, a sweet dappled grey mare I had been riding for a couple months. I looked beside my name to see the name Keeper written down. I assumed he was new. I grabbed the grooming box with his name on it and headed down the barn aisle to find his stall. Soon, I found a box stall at the end of the barn and peeked inside to meet my mount. 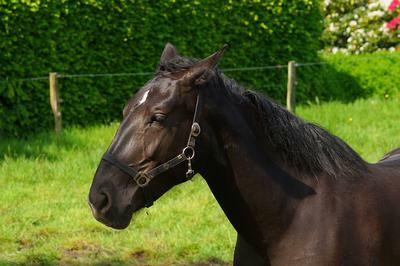 A dark brown horse around 15 hands with a stripe running along his face and a white sock on his hind leg stood in stall nosing his hay. It was love at first sight for me. Most people probably would have called him ugly, I thought he was beautiful. He stood watching me as I slowly let myself into the stall and stretched out my hand so he could smell me. There was a spark of spirit in his eyes and way of stubbornness in his attitude. After a few minutes of getting to know him, I groomed him and tacked him up for my lesson. He was an amazing mover. His trot made me feel like I was floating and his canter... I felt like I was in heaven rocking back in fourth with the rhythm. The next few lessons, I rode him and we got to know each other more and more every time. I started to help out on Saturdays and after my lessons on Wednesdays since I'm home-schooled. It had been about 5 months since we met and our bond was unbreakable. He followed me around like a loyal dog. He came to me when I called his name and he even went free jumping with me--even my trainer couldn't get him to free jump. We were jumping 2'6. We had ridden in our first show about a week before and we were going to start dressage in July which was about 1 month away. I started to tell Keeper everything. I told him about friends, parties, family and many other things. I told him secrets I told no one else. I had pictures of him everywhere hanging on my bedroom walls and constantly talked and dreamed about him. I dreamt of him almost every night. I had never loved anything more and I never will. This is awesome! Is it a true story? Please write more!